Monty Python, the most successful alternative comedy group, stomp into the Edinburgh Playhouse with their quirky and ridiculous production of Spamalot. The musical itself is “lovingly ripped off” from ‘Monty Python & The Holy Grail’ and features the epic quest of noble King Arthur and his knights as they are commanded by God (played by Michael Palin, of course) to embark upon a search for the illusive Holy Grail. Will they find it? Will they succumb to temptation along the way? Will we ever know the air speed velocity of an unladen swallow? Careful never to take itself too seriously, Spamalot is written by Eric Idle and John Du Prez and for best effect should be viewed with tongue planted firmly in cheek. Idle’s book remains as oddball as ever, and his songs with Du Prez really help to poke fun at musical theatre in a loving way – for example, the amusing Lloyd-Webber mickey-take The Song That Goes Like This or You Won’t Succeed In Showbiz. Providing star wattage in the production are Joe Pasquale as King Arthur and Todd Carty as Patsy, his trusty sidekick. Pasquale’s King Arthur is very funny indeed, with the comedian deftly throwing cheeky side gags wherever possible much to the audience’s delight, meanwhile Carty’s tour de force performance is a masterclass in clapping two coconut shells together. Stunning work. Throw into the mix the incredible vocals of Sarah Earnshaw as The Lady In The Lake, and stand out performances from each of the knights - Will Hawksworth as ‘Brave’ Sir Robin, Josh Wilmott as Sir Bedevere and Richard Meek as Sir Dennis Galahad (Meek also played the Black Knight with such ferocity and commitment, it was hilarious!). Chief amongst them was a comical Jamie Tyler as Sir Lancelot, who also elicited the most laughs from his other characters too – the memorable Knight of Ni (Ni! ), The French Taunter and Tim The Enchanterrrrrr. Overall, the staging is decent and the choreography dependably daft however it is the silly streak that lingers long in the memory. 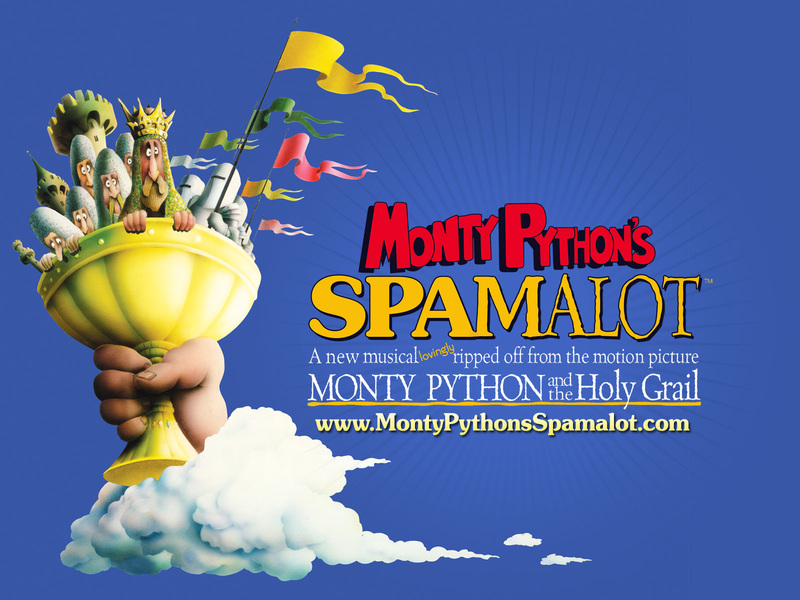 One of the hallmarks of British comedy is that it’s incredibly nutty and Spamalot doesn’t disappoint as it recalls the best moments of Python’s hunt for the Holy Grail and sends up beloved theatre convention. All the elements come together to prove that, like his Flying Circus before it, Monty Python’s Spamalot is truly the best alternative comedy musical. And it goes to show that these Knights of the Round Table do indeed have shows that are formidable. And you should visit Spamalot. It is a silly place.